Flint Ridge State Memorial is named after a narrow range of hills that extend from a few miles east of Newark almost to Zanesville. 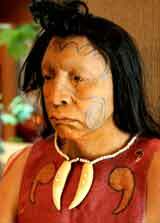 For more than 10,000 years, prehistoric groups used this area and the outcropping of flint. Flint is found in many places throughout the world, but this area was of particular interest because of it's beautiful color and texture. The layer of fling along this particular ridge ran from a few inches in some places to over 2 feet thick in others. Part of the park is an excellent museum and gift shop that gives visitors a thorough background on the importance that flint played in the lives of early Ohioans. In 1934 Flint Ridge became a state memorial to protect the natural beauty of the area as well as preserve its prehistoric and historic past. From studying this area it has been determined that this area was used primarily as a quarry site, and not as a village. Ohio's prehistoric cultures would visit here for short periods of time, long enough to remove enough flint to meet their immediate needs and then move on or return to their permanent villages found throughout the state. Some archaeologists believe that the Hopewell culture traded the brightly colored flint from this area for materials from other areas of North America. On the grounds there are several trails of varying lengths along with a natural trail for the physically handicapped that provides a hard-surfaced trail with informational signs in both script and braille. Removal of any artifacts or flint is strictly prohibited. Each year over the Labor Day weekend, folks from all over the country gather for the Flint Ridge Knap-In which is one of the largest prehistoric-arts and stone crafting events in the world. 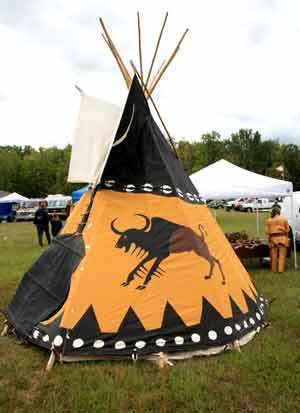 Besides a field full of vendors selling flint and other stone materials, there are also bone and antler materials for sell, demonstrations of arrowhead and knife making, field competitions and exhibitions including atlatl throwing. Flint "knapping" is the process of making stone tools (i.e. arrowheads, projectile points, hand axes, etc.). The ancient art of flint knapping has been around for about 4 millions years. Flint Ridge State Memorial is located just north of I-70 at the Brownsville exit. The museum is open May through October until 5 p.m. A small fee is charged for the museum for non-Ohio Historical Society Members. Flint is formed by a a geologic process whereby the softer limestones and shales are replaced with a much harder silica that creates a form of quartz. Formed millions of years ago, the softer rocks surrounding the flint were eventually eroded away leaving only the flint near the surface. Hundreds of quarry pits (one of which is enclosed inside the museum) are scattered along the ridge for miles. This particular type of flint was especially prized by the Hopewell culture that was so prominent in the area for 100s of years, especially in the Newark and Chillicothe area. The flint polishes up to a high gloss that was used in jewelry and other ornamentations. Because of the stone's brittleness, it could be easily chipped into razor-sharp edges, making it commonly used for knives and arrowheads. 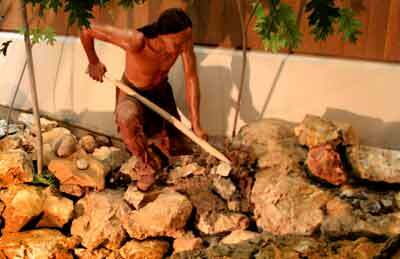 In later years, after settlers arrived in the area, they too quarried the flint for use in making grindstones. Above relieve sculpture shows a native Ohioan breaking off chunks of flint with a stone maul. In 1965, the 106th Ohio General Assembly designated flint as Ohio's official gem stone.